Seriously, how do you determine ROI and how do you use it to make IT decisions? This is not an easy question to answer, and one of the reasons is the difficulty of defining the problem. It boils down to costs and benefits. We at Cliffhanger, being engineers, take a practical approach by asking: “How often is a task performed” and “How much time can be saved”. Once you answer this, you can (or cannot) justify an investment. How often does the application need to be upgraded? We use continuous integration to rollout changes to the end user. Typically no IT involvement is necessary. This approach allows for A/B testing to further minimize impact and end users will see small incremental changes instead of large ones. How many support calls come in? Because of continuous integration (instead of a few large releases a year), support calls are less frequent and more spread out. So there is no need for IT staff to be on ‘high alert’ after updates. When the back office system allows for it, we fully support real time updates. In a way, you could say that even the data updates are a continuous process. This eases the load on hardware as well as IT staff because updates are rolled out more evenly over time. What is the process involved to get this data to the end user? The default approach is that data is available on demand. This guarantees the most up-to-date data being available to the user. In cases where this is not possible, the user can ‘download’ data before heading out. How to add more data systems? Atlas technology is not based on RDBMS, but on Search. Being schema-free adding additional data is trivial. Even changes to existing data sources are mostly 100% effortless. How much is extra hardware needed? This depends on a number of variables, but compared to traditional solutions, the answer is… less. The architecture is designed such, that peak load is minimized (also see points above). Our UI/UX expert makes sure the software is easy to use. Our software engineers ensure a performant experience. If you can use an app on your phone, you can use Atlas. Training of ‘super users’ or administrators typically only take part of a day. We very often hear that users on the business side like to upgrade to new innovative technology. From laptops to iPads, from desktop applications to app’s, from outdated local data to up-to-date data. From disconnected only, to online and disconnected when needed. Here are the reasons why Cliffhanger’s Atlas makes it worthwhile for both IT and Business organizations to upgrade to Atlas. You may have noticed the Augmented Reality screenshot that goes with this article. Atlas enables your asset information into an Augmented Reality world! Sorry, no Pokemon’s available! Due to the large customer base, our technology evolves constantly and was designed with the future in mind. A simple example is our scalability: The effort involved to install another server because other departments decided to use Atlas is -aside from making a server available- nothing more than making the IP address and port known to the cluster. Minutes, not hours or days! Atlas has 3 different ways to be implemented on the back office side. Depending on your needs, the following options are available, each requiring minimum effort. In a virtual or dedicated cluster, Atlas installs in a very short period of time. Typically in under a week. Installation does not require a lot of IT involvement: help in setting up a server and access to load a specific module to keep Atlas’s data up to date. Atlas can also be installed in the Cloud, even more minimizing IT efforts as Cliffhanger will take care of installation and maintenance. Only brief access is required to make sure that the Cloud server has a safe and secure connection to the back office. ‘Atlas’ in a box: a physical server that is a plug and play solution for your server rack. We preconfigure the server and software and ship it to you for installation, or provide on-site installation. Only ip-addresses need to be configured correctly and some cables plugged in! 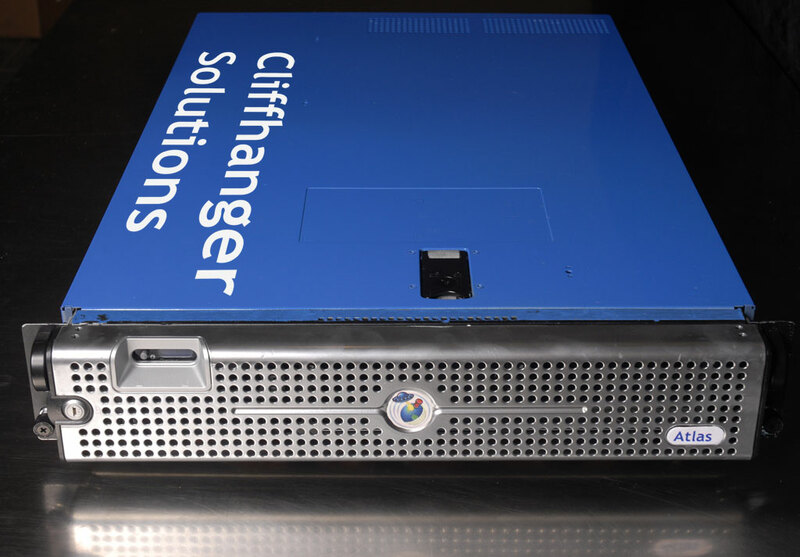 The hardware is provided by Cliffhanger or alternatively, customer hardware can be used. In all three scenarios, users now have access to their data via a browser, or an app and they are up and running, always with the latest data. No need to distribute data, no need to worry about converting data. The ROI is almost instant as any installation time or IT involvement will be earned back in less than a month by saving time on data distribution, data conversion, and support. The built in Analytics enables IT to keep track of application usage seamlessly. But it can also be used to monitor and detect intrusion attempts. While it may be harder to quantify ROI by being proactive, alerts and triggers might prevent disastrous intrusion attempts! Worried about training? Atlas’s graphical user interface was expertly designed not to require any training. And whether running it in a browser or in an App, the User Experience is the same! What support? No need either: the application is fully upgradable via the Play or App Store. No need to distribute new apps or run an upgrade script. Support calls will be limited because data is always up to date and no out of date data related questions will be raised.